Studio-inspired, high-performance Brushed Metallic and Matte-textured clays give you intense color in a whole new graphic way. Soft, flexible, clay-like hybrid textures go on beautifully with a unique ‘wet-feel’ that melts onto skin. This palette includes an exclusive Air-light Setting Powder to prolong wear for up to eight hours and to prevent creasing. GRAPHIC LINE: Use Laura’s Smoky Eye Liner Brush or Angled Eye Liner Brush to get a precise thin or thick smoky line. 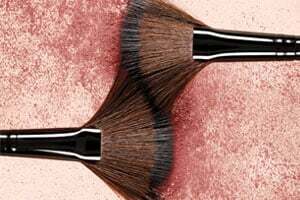 SET: As the last step for any of the above looks, use Laura’s Finishing Pony Tail Brush with the Air-light Setting Powder to keep everything in place and to prolong wear.